On their way to Dasca, Nancy and Iriel are abducted by bandits. Ahlan and the others rescue the women, fighting off the thieves and in the progress learn that the bandit leader has a map to an Aglari. They assume he is following the map because he is not in the bandit camp when Iriel and Nancy are rescued. They cannot permit the bandit to locate the gem first, so Daniel uses the gems they have to determine the location of the next jewel, taking them through a swamp, and forcing them to face monsters and hazards of all kinds. The novel is available in electronic and paper formats. I have been avidly following this series since the beginning and I am always looking forward to reading the next book. This book seems like a little bit of transition book but it did not drag things down like a transition book normally does, which is such a relief. This book seems to focus more on the internal turmoil that the characters are facing as well as building upon the interactions and relationships between them. We also get a glimpse into the other side of the quest, those that our characters have been trying to beat in this quest for the gems. I really enjoyed this look into the other side, it gives the storyline a little more of a sense of urgency than it had in previous books. The characters are also really starting to push themselves and each other to test their limitations and push beyond them, it is really great to see them all developing as the series continues. I am very excited that we are now halfway through the series and the momentum seems to be building, I cannot wait to read the next book! This volume in the saga was full of adventures for the characters on their quest the retrieve the gems. I found it easy and enjoyable to read. It kept my attention, and had me looking forward to finding out how everything will end. I'm curious if the characters will have more personal obstacles, or if the obstacles will continue to be focused on completing their quest. 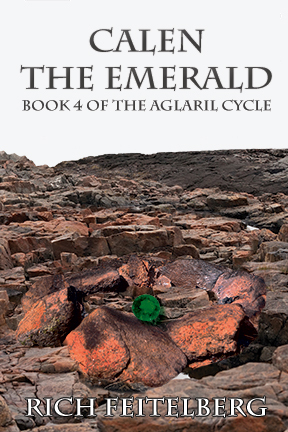 The Aglaril Cycle keeps getting better as the quest for the jewels continues. The characters continue to deepen and raise new questions about their backgrounds and motivations. I especially like the fact that while each volume fits in a continuing saga, it is also satisfying as a standalone. If you have any interest in the fantasy genre, give this series, and especially this volume, a try!